Unable to access files of Samsung Trend from Nautilus, when you connect device a problem happens: "Unable to mound Android, Unable to open MTP device '[usb:003,003]' "
If i try to access files such music or pictures in Android device, i get some errors. I can copy files from Android device, and paste to a home folder, like Pictures or Documents, and it's possible to see images or listen musics in this way, for example. The expected behavior is to see an ask window, and I could choose what I do with the device (open with Nautilus, Rhythmbox, Image viewer, Gthumb...). Maybe this bug is a duplicate of Bug #1203704 , but i'm not sure, because there is marked as "Fix relesead". I tried to connect in a different laptop, with other smartphone, same issue. Xubuntu trusty, tried access files with Thunar. I tested a samsung S4 mini (GT-I9195) with Android 4.2.2, same issue. 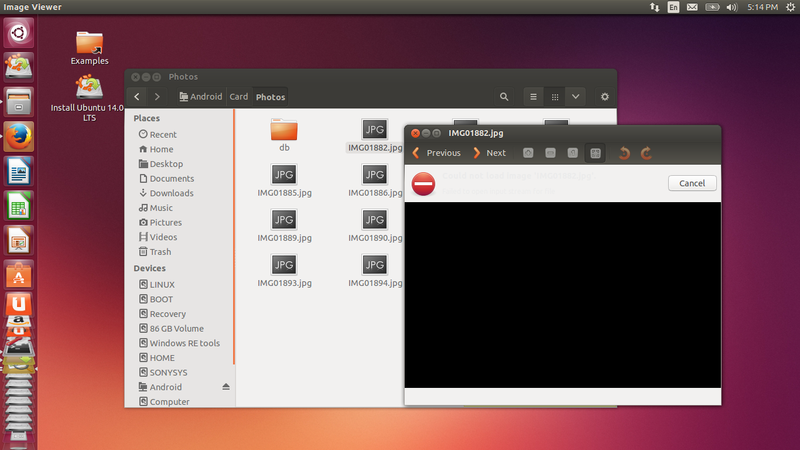 I would wonder why this issue is marked as "fix released" in bug #1203704 and gnome-bugs #695984. And it's not possible to do simple things like copy and paste, or cut and paste. 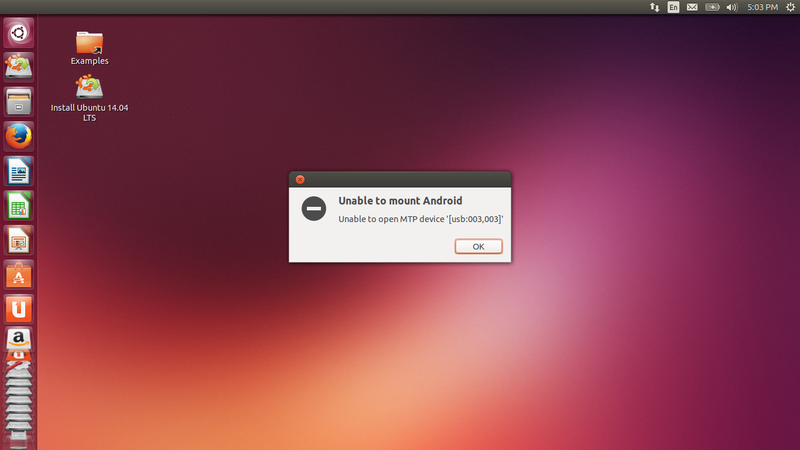 I have to delete file and copy from ubuntu to a new place in android. but on a Galaxy Nexus with Android 4.3 I do not see the problem and can access files directly. Both phones are setup with MTP enabled in USB settings. 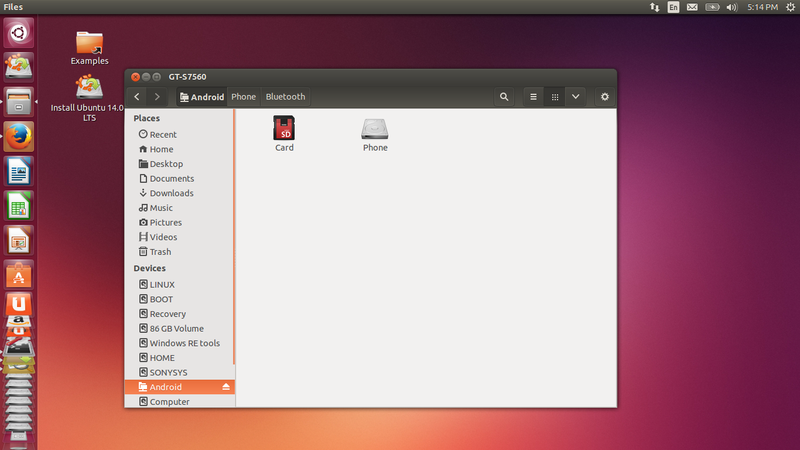 I am using Ubuntu 14.04 as well and I have the same problems with my Galaxy S3 mini (Android 4.1.2). If I plug in my phone I get an error message, that the phone can't be mounted. Then a window is opening where the internal and external storage of my phone is shown. I can browse through the folders but I can't open a file. Rhythmbox only lists a portable player, and if I start syncing music only the internal storage of my phone is used. I can't access the external SD-card using rhythmbox. I plug in my Galaxy S4 Mini (GT-i9192) phone, or my Galaxy Note8 (GT-N5100), and I get the "Unable to mount" error... I can't open any images (JPG, PNG, etc) inside the external SD nor in the internal storage, and no thumbnail is shown for those image files. Sometimes I get to delete files, but mostly I don't. 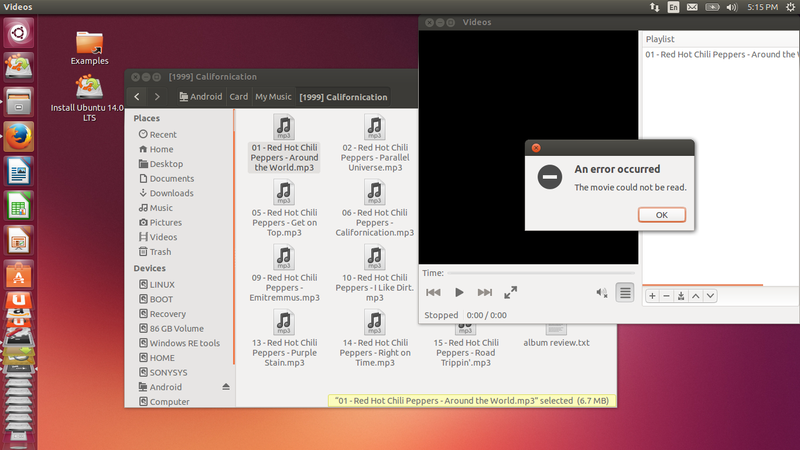 Problem is still present at Ubuntu 15.10 (Wily) - i know it's not released yet, but soon! Tried to edit /etc/udev/rules.d/69-libmtp.rules added the line for my Asus Zenpad, but there was no effect. Bus 001 Device 003: ID 0b05:600f ASUSTek Computer, Inc.
Device 0 (VID=0b05 and PID=600f) is UNKNOWN. I created the file /etc/udev/rules.d/51-android.rules like it was mentioned in an other post. Device 0 (VID=0b05 and PID=601f) is UNKNOWN. Joining to add heat. I think this would be resolved if the latest libmtp (1.1.9) were put into the repository for all LTS versions. The MTP backend does not seem to like them. 3. mount and access it from Linux. This should work in most cases. 5. create file with braces "()" in a dir on your MTP device. 6. mount and access it from Linux using `thunar`, `nautilus`, or even using `ls` or `cd` on the command line. This should produce the file manager (or console) to hang and no longer respond to user input, etc.